In 1859, the Hudson’s Bay Company invited the Oblate fathers to establish a mission at Fort Good Hope. One of the North’s most zealous missionaries, Father Henri Grollier, answered the call. Unfortunately, the spartan lifestyle and difficult travel conditions in the north took their toll on the ambitious Oblate. Father Grollier died at Fort Good Hope (map) a mere four years (1864) into his project. He was quickly replaced by Father Emile Petitot, who continued to build the church. He was assisted by Father Seguin, Brother Kearney, Brother Ancel, and several of the local Dene and Métis residents. With few tools and little spare time, the workers set out to build the most beautiful church in the North. 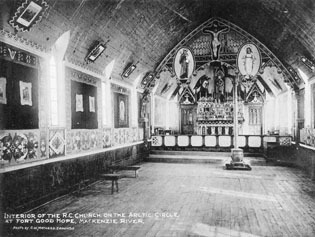 The overall design was very typical of most Roman Catholic mission churches in the Canadian northwest, but the interior and the woodwork were anything but typical. The dazzling interior is lavishly decorated in Gothic style. Every surface is covered with intricately carved woodwork, painted ornamentation and panels of biblical scenes and figures. Much of the interior painting was done with homemade paint made of natural dyes and fish oil. It took 20 years to complete Our Lady of Good Hope church in Fort Good Hope. The building is now a designated National Heritage Site.